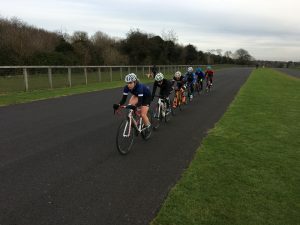 Behind the leaders, Jenny Bolsom (Bikechain-Ricci) was putting in a solid ride to take the third spot in the series standings behind Johnston and Nash. It is shaping up to be a close run thing between the top riders, and it wasn’t an easy day for those further down the pack with Uni of Bath’s Elizabeth Pressage describing it as a “brutal” race and saying that it was “six people working well together against me on my own”. 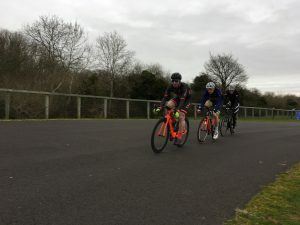 The men’s 4th cat race saw dominance from another strong co-operating group at the front with Jared Linden (Royal Dean Forest CC), Andrew White (Okehampton CC) and Ben Osborne (NFTO RC) going away early and quickly establishing a large gap. With their gap more than secure, the three started to cat and mouse a little going into the final stages of the race with Osborne like he was starting to play games with the other two and last weeks’ winner Linden looking to follow Johnston’s lead and make it two from two. He came in solo last week and this time around had White to contend with who had the jump coming into the finish. 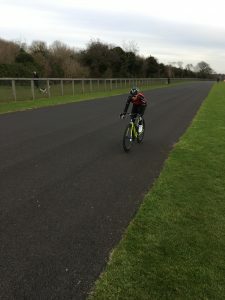 It looked like that was things done and dusted, but White clearly hadn’t seen the video of the finish from the men’s 2/3 race last week – he started to ease up and look over his shoulder as the line approached. Linden hadn’t sat up, and drew up alongside but couldn’t quite overhaul white. Another great ride from Linden puts him up to second in the series standings. John Russell had to settle for second this week after his close victory last time out, but can settle for padding his series lead by a healthy margin. This week’s race was far more aggressive than last time out, with many of the moves lead by VC Walcot’s Stefan Barnett. With a few small groups getting away early it was a solo move from Barnett that was the only one to stick, but the bunch always had the one rider in its sights and closed him down before the final laps. Team Tor 200 Kalas’ Charlie Revell had been patrolling the front of the bunch throughout and confirmed his dominance taking the sprint by a good margin – no controversy this time around. Revell and Russell were followed in by Will Perrin of Gannet CC, with Barnett rolling in off the back of the bunch having burnt his matches before the sprint.